When you arrive at Villa 360 Resort and Spa you have arrived at paradise personified. Overlooking the expanse of the lower Phang Nga Bay the blue horizon is dotted with islands and coast line of Krabi province some 40 km away. Tucked away form the hustle of the main village the Villa 360 Resort and Spa is a true get away a place to unwind and let your journeys end be the start of a memorable adventure. Gaze out over the infinity pool or take a lunch with views to die for, the Villa 360 Resort and Spa has a unique place on Phi Phi. The spa facilities round off a peaceful and relaxed holiday. The villas cascade down the slope and are reached on foot for the energetic or the golf buggy. The room finishes and the views from the balconies are tremendous and memorable. 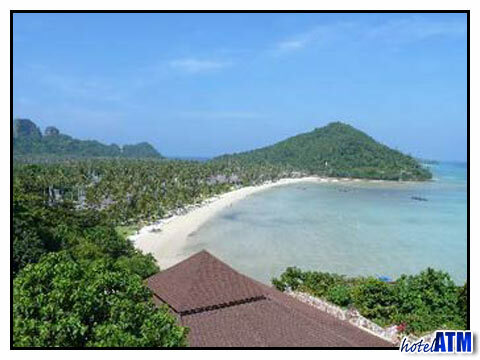 The Villa 360 Resort and Spa has a superb location to explore some of the remote areas of the Phi Phi island. A 12 minute walk takes you to Lanah Bay a deserted beach facing north surrounded by cliffs and hills. A 25 minute walk through monkey occupied jungle gets you to the 360 degree view point with stunning views of the village, cliffs and Phi Phi Ley. The coral reef is 350 meters from the resort. The Villa 360 Resort And Spa features in our Top 10 hand-picked hotels for 2 categories, including Best Honeymoon Resorts on Phi Phi, Best 4 Star Resorts on Phi Phi Island. 5/5 Lovely place with the most fantastic view!